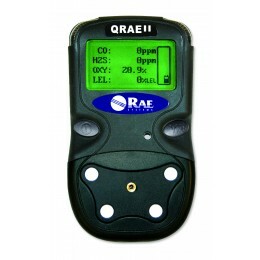 The QRAE II is a full-featured, compact, one- to four-sensor gas detector for oxygen, combustibles, hydrogen sulphide, carbon monoxide or sulphur dioxide. Key features include an easy to change battery pack, a water-resistant case and a new state-of-the-art O2 sensor. A lithium Ion battery model delivers up to 14 hours of continuous operation in diffusion mode. Detectors include data logging storage capacity for download to PC compatible computers, a backlit LCD display, easy to change external battery packs, easy access sensors, internal vibrating and audible alarm and IP65 water and dust resistant case. Each unit comes with full 2-year warranty, including all sensors.